* I was going to invite Senator McCain to the Transfiguration. Not anymore. * Ye of little faith. * I’ll turn water into wine for him, but I draw the line at being his designated driver. * Ironically, more men named “Jesus” will vote for me than will vote for Senator McCain. * The people want more jobs and less Job. * This just shows us that the McCain campaign is a non-prophet organization. 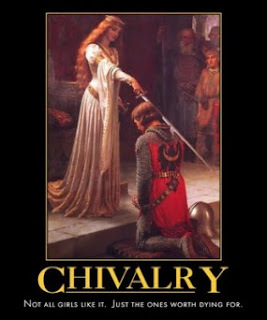 Eric will be delighted to know that I have found the limit beyond which I will not accept something into my life simply because it has echoes of chivalry and knighthood. You can see that limit right here. 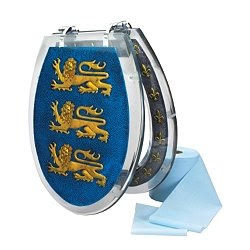 If there is an item in worse taste than a toilet seat featuring the arms of Richard the Lionheart (albeit with the wrong base color), I am not sure what it would be. Nominations are not solicited. A new video which features popular talk show host Oprah Winfrey denying Jesus as the only way to God has received over 5 million views on several reporting video sites. The approximately seven-minute video entitled, "The Church of Oprah Exposed," was posted less than a month ago and has claimed the a Top Favorites spot in the News & Politics category of a popular social networking site. Skip to 5:50 to where Barack Obama is explictly brought into the matter. McCain clearly intends his ad for humorous effect, but the folks downloading the Oprah video are in earnest. If you follow the link to the site, it is called "BlackVoices.com," and references another site which appears (based on the content of the ads) to be a Black spiritual site. These things are starting to percolate through the Christian churches in America, and race is no barrier to them. Insofar as they harmonize with the satirical point that McCain is making, the sense of satire may be lost. The BlackVoices site has a video -- already removed by YouTube, but I watched it this morning -- that explictly makes the connection between Obama and Biblical false prophets. We spoke of that a couple months ago (also here). I am strongly opposed to Senator Obama's election, for many and what I think are excellent reasons. I have no special love for Oprah. I hope that people will recognize, however, that Oprah is simply the modern version of the 19th century British aristocrat, seeking a faith that eliminates conflict in the Otherworld, so that it harmonizes with her current world. Having wealth and power, comfort and luxury, naturally she wants it to endure forever: and so a faith that promises no conflict through all Eternity is an attractive one. Who is wrong here? Some will say that Oprah is wrong, and there is a great deal of argument to be had there on theological grounds. Others may say that McCain is wrong, to mock Barack in a way that might be misconstrued (just as they said he was wrong to permit an ad that featured even a glimpse of white women, in case that might be misconstrued). That seems a bit overbearing for me, but I expect it will be said. Others will say that the Christians are wrong, to bring what are essentially non-rational concepts to bear on day to day life; but they are explictly licensed to do this by the First Amendment, which itself only recognizes an inalienable right the Founders attributed to "their Creator." I have said myself that Sen. Obama has only himself to blame, for adopting prophetic language in a country that has a strong faith tradition about such language: it's easy to be understood as a false prophet when you speak as a prophet, but are false as a politician. It's worth thinking through, though. I don't care for the Senator, and have little love for the Oprah movement either, but I would see everyone treated fairly. "Jake, are you all right?" The article is disturbing on several levels. Iwasaki, a Hillsboro native and decorated veteran, was honored last weekend as part of the celebration of the 60th anniversary of the desegregation of the U.S. armed forces. He served in a segregated unit that became the most decorated Army infantry group in U.S. history. Iwasaki fought across France and Italy during World War II and was wounded three times. He earned a Purple Heart with two oak leaf clusters and a Bronze Star before returning to Hillsboro in 1946. Despite Iwasaki's military experience, Washington County deputies are wary about people confronting gun-wielding suspects. Generally, what matters is the spirit. If the spirit is right, the mind follows: if the mind is right, the body follows. I warned about this over a month ago, when Obama first accused McCain of racism without any evidence whatsoever. The McCain campaign has exercised considerable restraint in its choice of criticisms, frustrating some Republicans over his refusal to even mention the Jeremiah Wright debacle. It has roundly condemned other Republicans who have tried to use that argument in an attempt to show good faith in this electoral cycle, and the only payback McCain has received is to be called a racist anyway. I agree that the Celeb commercial is pretty weak, but if it’s racist, then Obama has defined the term so far downward as to have no meaning at all. Yessir, there is nothing like a little honest dialog about race relations in America to dispel all that wrong/bad tension between blacks and whites. Because the Other Side, you know, they operate from the Politics of Fear. And the only way to combat the Divisive Fear and Hate perpetrated by those hateful, divisive fear mongers who keep dragging race into this campaign even though I'd prefer not to mention it is by constantly reminding you of Fear and Race. Because we all know that any criticism of Me during a hotly contested political campaign can only be based on 400 years of simmering racism. I imagine that we'll see a lot of this kind of thing if Obama is elected President. And perhaps the best reason to vote against Obama is to spare the country an administration that reflexively characterizes any criticism as racist. It occurs to me that this -- if not quite a reason to vote for Sen. Obama -- could be a major consolation prize if he is elected. It's already the case in America that "racism" has gone from actual racism -- I remember the KKK passing out their literature on the courthouse square when I was a boy -- to "institutional" racism. "Institutional" racism is combatted in this country via a huge arrangement of what are meant to be counterbalances, but which are now the only way in which race is openly considered. Thus, the only formal recognition of race in society is designed to redound to the benefit of minorities. This is a rhetorical shift in the same direction as the shift we've already made politically: racism as a concept is being emptied of meaning, except as a hedge for those groups once disadvantaged. What does it mean? Anything. Therefore, nothing. The McCain campaign is guilty of racism even if they can only be suspected of having subconscious impulses that might have possibly informed an ad they put out; even if they strictly forbid actual racism; even if they squash attempts at legitimate criticism that might make an issue of race; even if they have been subject to actual racism themselves, in an earlier day, and learned to despise it. Therefore, they must always be guilty of racism; and therefore, racism is not a charge to be taken seriously. It is instead a condition -- like the necessity of having oxygen around to breathe -- that you simply accept and ignore as a basic feature of reality. Once we get there, the advantage of raising charges of "racism!" will wane to the point that it will likely go away. Four years of a President Obama waving the flag over every criticism will probably do it for most of America; the holdouts will find their currency so debased that, though they may continue to try and spend it, it will buy them little. Thus we might really "hope" to "end racism" through President Obama after all. Middle Americans, to the degree that they are conscious of race -- the younger generations seems much less so even than mine, and mine far less than the one before -- already think of it only in terms of ameliorating the harm of historic racism. When people become convinced that the charge is finally empty, we may at last walk away from this most poisonous of weeds. “We have come … to express our gratitude and appreciation for the sacrifices made by these great warriors, soldiers, in freeing the Iraqi people and in helping us in Iraq recover from tyranny and dictatorship,” Jawad Karim al-Bolani, Iraq’s minister of the interior, said through a translator... “We also want to express our gratitude to the families of all these great men and women and express how important their sacrifices are for our nation,” he added. I haven't mentioned the subject of another visit that didn't happen, and don't intend this post to serve as a proxy for it. This, though, is what it's supposed to be about: and it's genuinely inspiring to see this man speak so. The interior ministry, if you don't know this, controls much of the police function in Iraq: so he speaks as a man who has had occasion to watch the fall of violence firsthand. Here speaks a man who knows what these wounds bought for his nation. Cassandra is compiling lists of great war movies today. This is something we've done a few times, but I have to remark on a couple of the entries suggested. Bthun suggested "Casablanca." That's an interesting choice. It's not a "war movie" according to what I would normally think of as the defining features of the genre: all the actual fighting is quite a long way away. It's very much on the fringes of a war, though the war is large enough that it drives the plot. More, though, it was written to encourage the United States to join a war. In that way, it is truly a war movie. Another one that is mentioned is "Gone With The Wind." This is the point where I have to make my own confession, similar to those literary confessions from a day or two back. I have never seen "Gone With The Wind." I realize, for a Southerner -- and a proud one -- this is a shocking omission. Nevertheless, I have not. Harris County's animal control division wants the Legislature to allow its officers to use telescoping batons to fend off attacking dogs amid a sharp increase in the number of aggressive stray pit bulls in unincorporated areas. Animal control officers say the batons, called "bite sticks," can prevent serious injuries by intimidating aggressive, charging animals and blocking their attempts to bite. But they currently are prohibited in Texas under a state law that bars most people who are not certified peace officers from carrying clubs. Texas state law allows the carrying of firearms, of course: just not clubs. Georgia law is no better. I have a firearms license, which means that I can carry -- openly or concealed -- pretty much anything short of an automatic weapon. .44 Magnum revolver? No problem. A pair of Glocks and a dozen extra clips? Perfectly legal. You can carry a knife, with certain exceptions, if it is carried openly, OR if it is not "designed for the purpose of offense or defense"; but that latter has been defined by the court in really strange ways that I still haven't fully sorted out. A cop I know tells me "it's OK if it has a clip on the outside, and it folds," but there's nothing in the law to suggest that, and I see no reason a DA couldn't decide to prosecute you on the plain meaning of the language. On the other hand, I know several knifemakers, and could get a letter from them stating that they'd made me a custom knife "not at all for the purpose of offense or defense, but purely for the enjoyment of being able to open boxes and cut onions with a handmade work of art"; but presumably that plain-language defense wouldn't stand up. As we begin to talk about the ramifications of Heller, it will matter how "arms" are defined. The second round of lawsuits is now under way, challenging Chicago's handgun ban to try and get the 2A incorporated to the states; and also challenging DC on its attempt to ban semiautomatic handguns by fiat, though they are the most common form of firearm chosen for self defense. There is no obvious reason, however, that more primitive forms of arms should be banned. 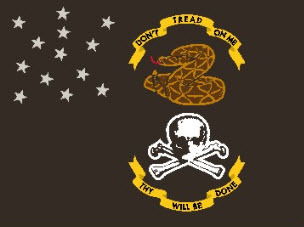 The Founders took the field with everything from muskets and Kentucky Long Rifles to knives, swords, and clubs of the type in common use among the Indian tribes of what was then the frontier. I've never been a big fan of the Olympic Games. I did my best to avoid them in Atlanta in 1996, at a time when I was living there. On the other hand, I was in China during the 2000 Olympics, and I can tell you that the Chinese take it very seriously: it was absolutely eerie how the streets became empty. Millions of people disappeared, in order to watch the games huddled around whatever television they could find. And when China would win a medal, everyone would cheer. My wife and I, walking through the darkened and empty streets of a normally-bustling city, would suddenly hear a high cry as a few million voices raised together: everywhere, but out of sight. So it is with tremendous pleasure that I read that at least two of Iraq's Olympic hopefuls will be competing this year. It is a disgrace that the Olympic Committee couldn't get off its... ah, couldn't find a way to resolve the matter in time for the other hopefuls to compete. It will mean a lot, though, to the people of Iraq to get to see their champions in competition with those of the other nations of the world. I'll be rooting for Ms. Dana Abdul-Razzaq. In the Olympic spirit: Good luck. Bon chance. ¡Buena suerte! I'd put it in Arabic, but I don't have enough of the language to know the form. A new study, which got attention from slick Time Magazine, purports to show that moderate exercise won't help you with your long-term weight goals. How scientific was this study? I love that phrasing: "A slightly different data set than they had planned for." Actually, I think what the scientific study has definitively proven is that laziness is very hard to overcome. Even with free treadmills, regular group meetings, and telephone pep talks. The rest of the study's data, breathlessly reported in a major news magazine, are called into serious question by the utter breakdown of their methodology. I'd love to know who was responsible for funding a program for two years when "within a few months" it was clear the methodology had failed, and the results from the study would therefore be entirely unusable for the intended purpose. This points to a serious problem with far more than literature theory, though: the academic world has become extremely derivative. Nothing will produce greater disdain than writing a paper on a work of literature or history, or a scientific topic, which does not show that you have read the important secondary works on the subject. In a way, this makes sense: if you aren't aware of the important work already done on a topic, how do you intend to build on what we already know? We are pushing against the limits of human capacity. There is a short span in which a man lives, learns, writes, and dies. The need to build on what has come before us must, of necessity, cut into our capacity to see the original picture. As we were discussing Sidney Lanier, look again at his capacities: Middle English and French, Welsh, Anglo-Saxon. A man who today wished to be an expert in Anglo-Saxon poetics, as he was, would scarcely have time for any of the others. He would be swamped in secondary sources. What is the answer? A second ring of generalists of the old sort, to check the specialists against the bigger picture? Via The Donovan, the funniest thing I have seen in ages. This guy looks exactly like an Army Reserve Captain I used to know. As a continuation of yesterday's post on the ethics of manipulation, an interesting example from the Hundred Years' War. 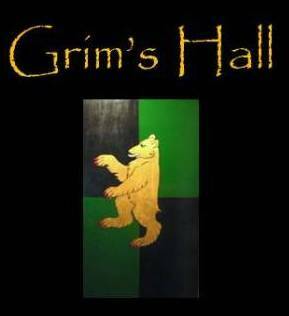 * Sir John of Norwich is commanding a garrison in a city that comes under siege by a large French army. Discovering that the citizens are inclined to the French, that he has few provisions, and that there is little hope of aid from the main army, he decides to escape with his trusted companions. He summons the Duke of Normandy, commanding the French army, and obtains a one-day truce to honor the Feast of Candlemas, "in honor of Our Lady." Then he packs up his stuff, and boldly rides out on that day directly through the French Army. Obliged by his word and his honor, the Duke allows them to withdraw in peace. The poet Sidney Lanier,** in his redaction, adds a footnote: "This act of Sir John Norwich was mean and small beyond all decent words; for he took the basest advantage of the Duke of Normandy's honorable confidence in his fidelity to the sacred obligations of a truce." In truth, I doubt the Duke minded much, since the result was that the city surrended to him peacefully. He obtained whole and without bloodshed what might have come to him in a far poorer condition, and with some loss. Military deception has advantages and also disadvantages: a man who keeps his word and his truce in war does profit by it, especially in counterinsurgency efforts to win the population. Part of the reason the people of the city were inclined to be ruled by the Duke of Normandy was his honorable and decent character. By the same token, American efforts in Iraq have profited strongly by the understanding that we would keep our word. Of all the actors in Iraq, of all the factions, we have been the most reliable: our terms are clear, and if you adhere to them, we will defend you and further your interests. While Iraq's factions still want self-rule, not American protection, they find it easier to trust and work with us as brokers than they do even with each other. Deception, while useful in certain cases, will dissolve that key advantage if overused. On the other hand, trusting the enemy's word leaves you open to manipulation. It worked to the Duke's advantage in this case, but obviously it does not always. Likewise, there are times when deception is the only chance for a weaker party to attempt a danger: Sir John of Norwich saved his command unharmed for future battles this way; and centuries later, Allied forces were able to attempt Normandy due to careful efforts to distract its defenders. Insofar as men must carry out these deceptions, we should still try to establish an idea of exactly when "sometimes" is. * If you follow the link and head down to the next chapter, starting on p. 122, you can read an interesting account of medieval counterbattery fire. ** It should be noted that Sidney Lanier practiced what he preached. He was a pilot on blockade runners, assisting English vessels in shipping Confederate cotton out through the Union blockade. On one occasion the ship was borded, and he refused to don an English uniform or deny his status as a Confederate. The Federals imprisoned him, and he contracted tuberculosis in prison, which tormented him the rest of his life. He has, therefore, earned the right to speak on the subject as a man who has sacrificed for his principles.